I’ve always sought to create experiences for students, presenting them with opportunities to interact with the content, and with each other, through simulations, debates, enactments, trials, service learning opportunities, and Socratic Seminars, to name a few. When carefully designed, from set-up to reflection and debrief, these opportunities become extremely powerful and memorable learning experiences for students. I'm teaching at an international school in Athens, Greece and can't think of better place for students to engage in Socratic Seminars and many other forms of classroom dialogue. It's perhaps a little odd to be teaching American Studies here, but we've created an amazing integrated History & Literature American Studies course and our 10th grade students come from all over the world, bringing with them vastly different perspectives to the themes of the class – our goal is to consistently create opportunities for their classmates to hear them. Even though I’ve always planned under the premise that I shouldn’t be the one doing the most talking, especially within classrooms of such broad diversity, 27 years of teaching experience has also taught me that our students aren’t always equally equipped with the skills to question, to construct dialogue and above all, to listen—not only to us but also to their peers. Indeed, we can't assume that students have an understanding of the “soft skills” of communication, inquiry and leadership, especially of those needed for true dialogue and collaboration. It is in this context that I share three lesson strategies that my teaching partner and I have developed to even more intentionally scaffold the essential skills of dialogue into our lesson designs. Over the past two years, with our expanded use of Socratic Seminars, these are but three things that have made a huge difference in the level of performance of our students! Lesson Strategy #1- Listen.... and start from there! We didn’t start the year with classroom rules and lengthy explanations of expectations, rather we started with listening: students listening to each other and engaging in the idea of what true listening means. We asked students to read an article that I came across by Nancy Kline, entitled “Learn How to Listen in a Radically Different Way”, which was published in December of 2015 on utne.com. We emphasized that without carefully reading the article that they wouldn’t be able to participate in the next day’s lesson with their peers; encouragingly, nearly all students reviewed the article at home, highlighting and annotating key take-a ways. Using a powerful text protocol entitled “Save the Last Word”[i], designed by the National School Reform Faculty®, we placed the students in groups of four, carefully spacing them around the room so that each group had its own little personal zone. We began the lesson by lighting-up the wall with a quote by a Greek Philosopher, Epictetus, who reportedly said, “We have two ears and one mouth so that we can listen twice as much as we speak.” Our students were not amused when we told them that today they would have three ears, and listen three times as much as they speak. After carefully facilitating the set-up, we watched the students engage through the steps of the “Save the Last Word” protocol; students actively shared their choices of extracts and listened to their peers’ interpretations of those extracts, before they themselves had the “last word”. This double block of 45 students was simultaneously practicing, applying, and engaging their listening. Students reflected during the debrief, sharing stories from their own lives, especially about times they had felt listened to and when they had not. They shared how the lesson went for them, mostly positive, acknowledging their peers’ contributions and their own understandings. They also reflected on how difficult the process was, sharing their reservations about the effort needed to truly listen. What an incredible foundation for the creation of a learning community in our classroom! We as teachers first need to understand the differences among dialogue, discussion, and debate before we can expect the same from our students. I first clinched an understanding after reading Peter Senge’s classic about learning organizations, entitled The Fifth Discipline. If you haven’t read it, I totally suggest that you do. Although I initially found it difficult to capture Senge’s tone while reading the print version, when I yielded to the audio version during my morning commutes, Senge’s systems thinking philosophy came alive. 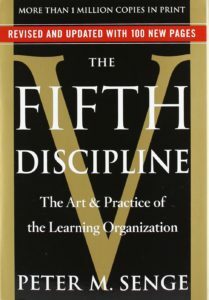 When you get a copy of The Fifth Discipline, either fast forward or flip to chapter one where Senge presents a description of dialogue as a key discipline of a learning organization that seeks to create “team learning”. It’s perhaps a little dense for students, but an important base for us teachers. I totally recommend his book for valuable insights and if you prefer only the extract, it’s online as a teaser. I think that you’ll find as I have that his systems thinking approach, especially in education, resonates often! To help the students understand the difference among dialogue, debate and discussion, we created a thirty minute mini-lesson that could also be used in nearly any middle school or high school class. At the start of class we announced the goal of the introductory lesson and distributed the following handout entitled “Socratic Seminar as Dialogue vs. Debate”[ii]. One by one, we whittled through the students’ observations and conclusions to reach a better understanding of the differences among the three modes of interaction. It was with this base of shared understanding that we then distributed the overall procedures and details of how we as a class would conduct our Socratic Seminars. After the class finds a common understanding of the key elements of listening and dialogue, in many ways an understanding that they themselves create, they are better equipped to construct richer Socratic Seminars. As well, I find these added layers of concept and skill development essential to a classroom that continually invites dialogue, whether in daily lessons or in Socratic Seminars. When motivated to become better listeners and questioners, and when guided to build understanding through contextual references, students carry the class into another realm of instruction. 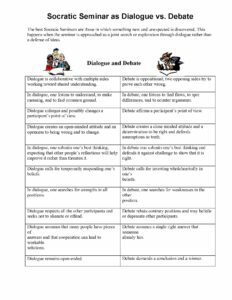 As a side note, here’s another useful resource entitled “Comparing Debate, Dialogue and Discussion”[iii], which may be more applicable for groups of students with more experience with Socratic Seminars or it can be used mid-year to expand or reinforce the concepts presented above. John Dewey, American Psychologist and Educational reformer proclaimed in 1933 that “We do not learn from experience, we learn from reflecting on experience.”[iv] Within any process, debrief and reflection are undeniably inseparable from growth. Here, in this third strategy, we offer an innovative way to improve student reflection to build better classroom dialogue, with wider more equitable participation. How did the group share its airtime? Were some students with a lot of ideas, just a little too quiet? Were some of the group members doing way too much talking? How much time was taken in “chaos”, with too many students talking at once? How equitable were the contributions of the group members in comparison to past seminars? 1) What do you notice about yourself? 2) What do you notice about the group as whole? 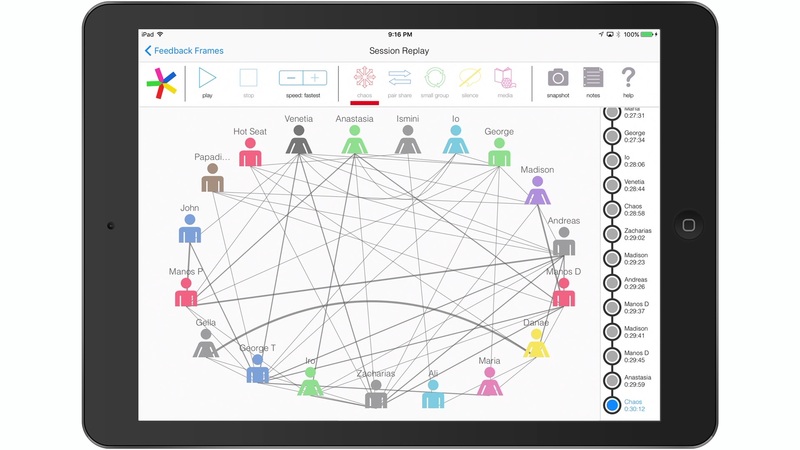 One by one, I show the group images from the Feedback Frames, beginning with the graphic Playback Session of the seminar. I replay the charting of the seminar at the “faster” or “fastest” speeds, with a 30 minute seminar taking 30-40 seconds to replay. After they observe the graphic replay, I remind them to write something in each column of their T-Chart. 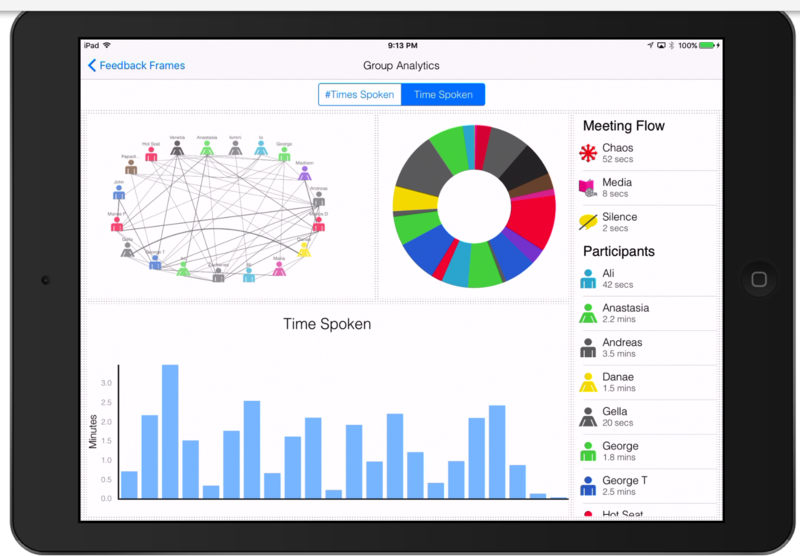 Moving to the Group Analytics, I tap on each participant for the # of Times and Total Time Spoken by each student. Once again they are reminded to write something on their T-Chart. 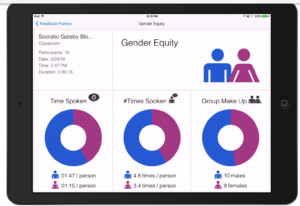 Continuing, I display the Gender Equity, pausing for them to interpret and reflect on the average time spoken and the average times spoken by males and females in the group. Finally, I reveal the group’s Equity Factors asking them to observe the levels of participation and the overall Equity Quotient for the seminar. I suggest that they may want to consider the Equity Factors from their last seminar when reflecting on their T-Chart. Largely depending on time, we sometimes have them pair up to reflect on their notes, while other times we will share out ideas immediately in the large group. At the very least, we ask them to write 2-3 conclusions based on their reflection notes from their T-Chart. My favorite version of the class debrief is to end with each student using their reflection notes to set a personal goal and to suggest a class goal for the next lesson or seminar. These are typically given as exit slips (we refer to “Check-out” slips) and can easily be highlighted during the next day’s warm-up activity. Another way of looking at the potential of Equity Maps is to think about the power of providing readily accessible formative assessment data to inform students’ learning and growth. 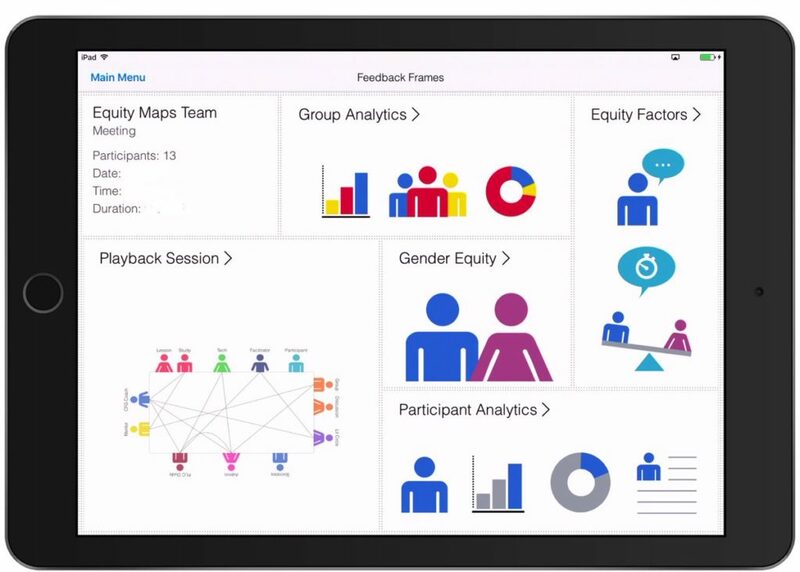 Here, Equity Maps provides formative assessment data both as responsive feedback “for learning” and reflective feedback “as learning”. Watching the process unfold confirms that the strongest growth occurs when students come to their own conclusions after having observed the data and upon receiving grounded feedback from their peers. 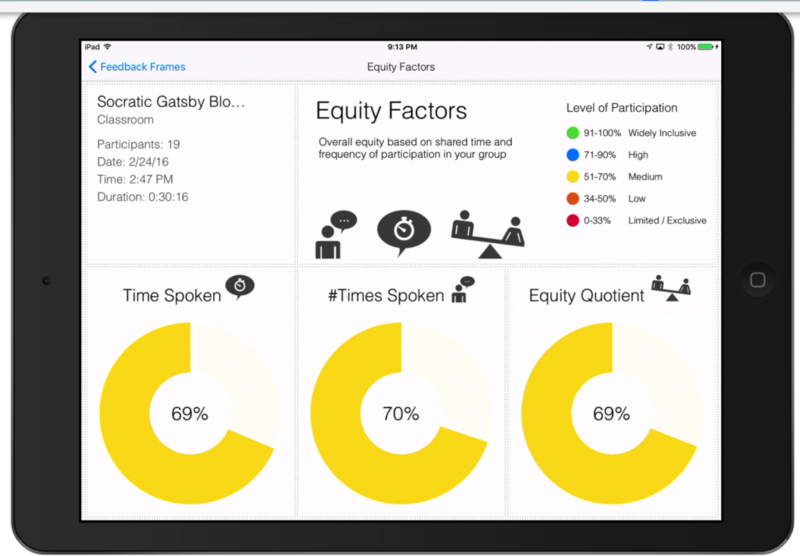 As we, along with several other teachers, have used v1 of Equity Maps iPad app in the classroom, we’ve also realized that the app itself can be expanded to address additional needs, such as expanded data for student reflection and for summative class assessments. After considering the feedback from several users, we are preparing v2 of Equity Maps, which will bring added functionality of customized room arrangements, new “check-lists” that will allow users to take notes on the quality/nature of each student’s contribution (ideal for tracking custom characteristics or performance data for participation rubrics), and expanded Participant Analytics for student reflection and/or summative assessment data for teachers. These are just a few of the features that will be added soon, available free of charge with the next update and purchase of v1 of Equity Maps. I look forward to hearing your thoughts as well as your own strategies for improving these “soft skills” in the classroom. I'll be listening carefully and I'm looking forward to reflecting on what’s to come! A special thanks to Mr. J. Rue, Mr. Hercules L, Mr. Pappa W, & Mrs. G Young: Inspiring Literature Teachers-- Fantastic working with you in the classroom! 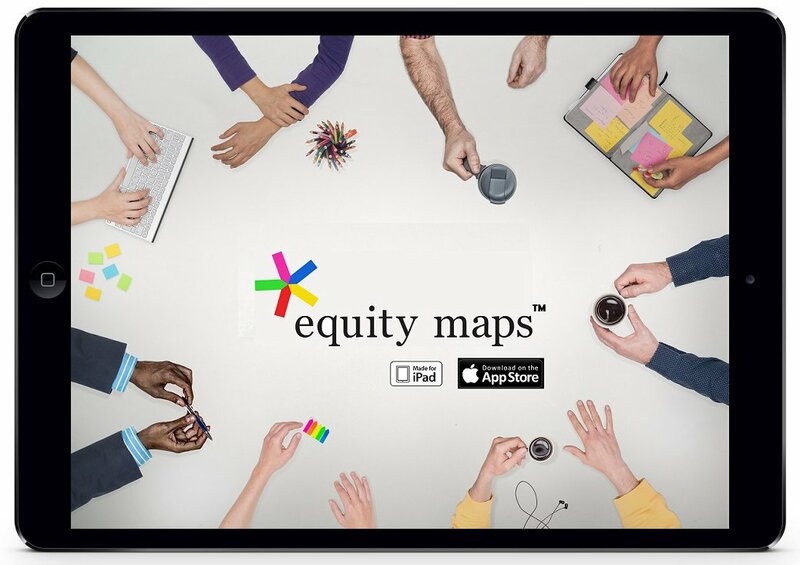 There are multiple ways to connect Equity Maps to your classes’ projector or monitor. The fastest is to stream via an Apple TV using iPad’s AirPlay. When I don’t have access to an Apple TV, I use a fire-cable with a VGA plug directly to the projector. Another excellent option is to download X-Mirage to stream directly to your projector connected computer. [i] “Save the Last Word”, www.nsrfharmony.org. The older version of this protocol is available for free on the National School Reform Faculty® website. 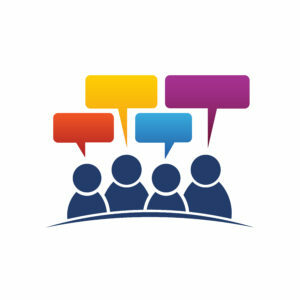 I recommend, however, the newly designed protocols, which you can obtain by becoming a member or becoming trained as a Critical Friends Group® coach. Money well spent with many incredible tools for your classroom! 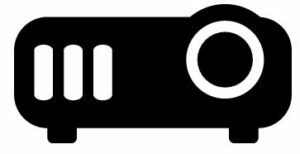 [ii] I’d like to cite this properly, but haven’t found the origin, although it ubiquitously appears over the internet; if you created it, I’d love to know so that I can give you credit. [iii] This source was compiled by compiled and adapted by Ratnesh Nagda, Patricia Gurin, Jaclyn Rodriguez & Kelly Maxwell (2008), based on “Differentiating Dialogue from Discussion” a handout developed by Diana Kardia and Todd Sevig (1997) for the Program on Intergroup Relations, Conflict and Community (IGRC), University of Michigan; and, “Comparing Dialogue and Debate,” a paper prepared by Shelley Berman, based on discussions of the Dialogue Group of the Boston Chapter of Educators for Social Responsibility (ESR). [iv] Dewey, John. How We Think. Boston, MA: D.C Heath and Co., 1933. p78. ⟵Inequities are all around us…they don’t have to exist in your classroom or group!